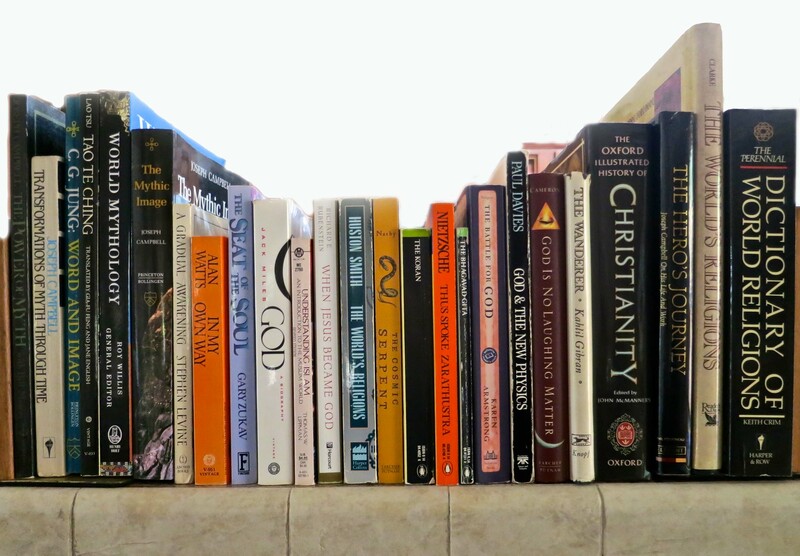 I checked our library and found about 100 books relating to spirituality that I have read over the years. This is a sample that I pulled off of our shelves. Peggy served as a principal of a public elementary school for several years and would occasionally be confronted by people who wanted to limit what their children were being taught. One day a man stomped into her office infuriated that his child had picked up a book on dinosaurs at the school library. She calmly asked what the problem was. After all, most children are fascinated with dinosaurs. “Dinosaurs,” he told her with barely controlled rage, “are not in the Bible. They never existed. My child is not going to learn about dinosaurs.” Apparently Peggy was to immediately remove all books on dinosaurs from the library and to instruct all of her teachers that they could not teach about dinosaurs. Limiting the flow of information has been a powerful form of control over what people think for thousands of years. Political, social, and economic dominance have all been maintained by controlling access to knowledge. Religions have historically used a similar approach in influencing what people believe. The anti-dinosaur man is a modern example. In 1961 I picked up a Barnes and Noble book on comparative religion and learned about Mithraism and Zoroastrianism. I caught a glimpse of how much our great monotheistic religions are based on earlier belief systems or mythologies. The strong religious convictions of my teenage years began to crack. Studying history didn’t help. In reading about the Roman Empire, I learned that the nature of Christ’s divinity was determined by vote at the Council of Nicaea in 325 AD in a bare knuckled political battle, not the most holy of environments. My rock that was Peter made a dramatic shift and relocated itself to an active fault zone. So, I stopped going to church. One day I ran into Father Baskin, my minister at the Episcopal Church. I liked him and his family. He had been a photographer and was well into adulthood before deciding to become a priest. His wife, a joyful, hug-you-on-sight type of woman, had grown up with a missionary family in pre-communist China. They had two sons slightly younger than I was. “Of course,” I replied, preparing myself for a lecture on the importance of having faith. Wise words: they could be applied to all of the world’s great religious writings. Deeply inspired visionaries strive to understand and explain their visions within the context of their cultures and personal experience. Disciples then come along to interpret and reinterpret the messages to keep them relevant, reflect their own inspiration, maintain control over the flock and win converts. Divine revelation and practical considerations walk hand in hand. We end up with metaphorical truths that point us toward the original source of the vision. And we end up with religions, the keepers of the metaphorical truths. Unfortunately, it is hard to sell a metaphorical truth, even to our selves. A Christ walking on water and granting everlasting life is infinitely more satisfying and reassuring than a Jesus struggling with the nature of his humanity. This is where faith and miracles enter from stage left. When I walked through the door of the Church, I would still be expected to profess my belief in virgin birth and resurrection. Modifying the Nicene Creed to fit my sophomoric understanding of theology was not an option. Even if I managed to silently slip in the word metaphorical, I still had original sin to deal with. I could accept the fact that I was petty, dishonest, and wrong at times— that I needed forgiveness. But I couldn’t accept that I was inherently sinful or evil. Since we are 98.8 % chimpanzee, genetically speaking, what seemed sinful to me was to blame Eve (woman), or even the snake, for our monkeying around in the Garden. Father Baskin’s wise words gave me much to think about, but I wasn’t ready to rejoin the flock. While I was learning about Christianity’s connection to mythology, I was also learning about Crusades, Jihads, Inquisitions, and various other ‘Holy’ wars. Doing unto others in the name of God, Allah, Jehovah, etc. seemed close to a commandment. For all of the good religion had done down through the ages, and there is a great deal, it had also been a factor in much of the world’s violence and intolerance. I came to the conclusion that there was a fly in the ointment, a fatal flaw in religion that may yet bring about the Armageddon that so many fundamentalists believe in. This flaw is tied to two of religions most powerful driving forces: the concepts of exclusivity and faith. Exclusivity in religion is tribal theology. It is the belief that there is only one way to pass through the Pearly Gates and that our particular brand of religion holds the key. It gives us special status. One doesn’t have to travel very far down this road to assume that other people are less blessed or even evil. Exclusivity can be used to justify wealth, dominance, missionary zeal, Holy War and almost any other thing we want it to. The idea that an all-knowing, all-powerful, all-wise being would have a chosen people seemed like a contradiction in terms to me. That He would send these people out to kill in His or Her name was inconceivable. Exclusivity appeared like one more human rationalization, a clever ploy to recruit members, fill coffers, and benefit specific groups at the expense of others. Limiting interpretation of ‘God’s Word’ to selected people and adding unquestioned faith to the equation created a recipe for power and control that was far too tempting to ignore and, unfortunately, abuse— over and over again. Faith allows us to plow forth in the face of adversity and often gets us through the dark night. It can be a powerful force for good, but it is also the underpinning of exclusivity. You can’t get there without it. How else could we convince ourselves that our particular brand of religion has found the one true path to God? We leap before we look and then work backward: the greater the leap, the greater the faith. I believe, therefore it is true. Rational questioning is not allowed. Our Founding Fathers, the people who wrote the Declaration of Independence, the Constitution and the Bill of Rights, had a profound understanding of the power of religion to be corrupted. They had seen Holy Wars tear apart Europe and kill millions. They wanted to protect the newly formed United States from a similar fate. There would be a strict separation of church and state. The state would no longer use the church to control the masses as it had for millennia. The church would no longer use the state to eliminate competition. People would be free to worship as they chose, whether it was a brand of Christianity or some other religion. Several of the Founders were actually Deists who believed that spiritual truths could be reached through reason alone. Revelation and miracles were not necessary. Thomas Jefferson followed this logic to the point of going through his Bible and snipping out the miracles. I decided to let time sort out my own belief system. There is no doubt that religion is an important part of who we are. My negative thoughts did not eliminate my need for having some type of spiritual grounding. I was in complete agreement, however, with the importance of letting people worship as they choose. It is wrong for one religion to force its viewpoint on others of different beliefs. NEXT FRIDAY’S ESSAY: I conclude my series on religion with my 80-year-old father and I discussing God while sitting around a campfire in wild Alaska with snow falling gently from the sky. 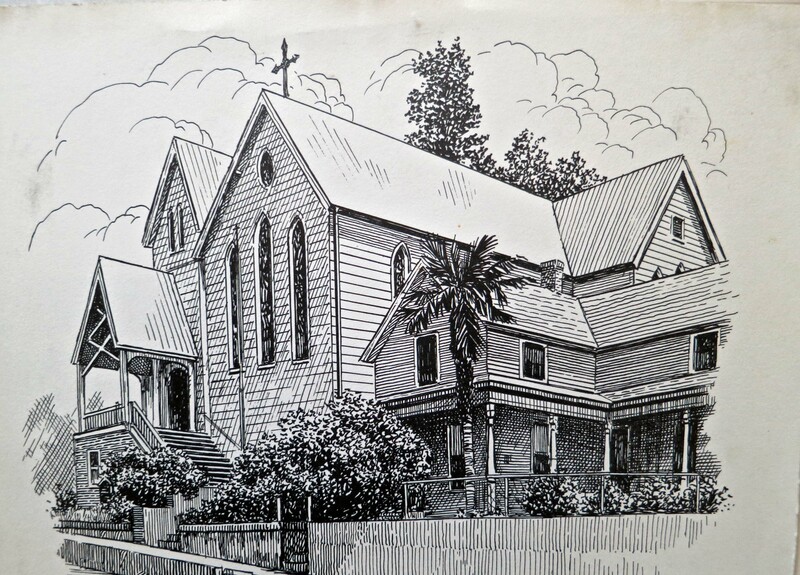 The Episcopal Church in Placerville played a significant role in my life for 16 years. In my last Friday essay on Finding God in all the Wrong Places, I learned that some miracles are best witnessed with your eyes shut, and that the radio preacher my brother and I listened to on Wednesday nights believed the road to heaven was paved with gold— for him. It was not the best introduction to religion. My parents had a burgeoning seven-year-old skeptic on their hands. But they weren’t giving up on introducing their children to church. Next on their parental road map to religious enlightenment was the Episcopal Church of Our Savior in Placerville. This time they used a different tactic, bribery. After church, we stopped at Tom Raley’s grocery store and were allowed to buy a Pepsi and pick out a comic book. I would eagerly search the rack for the latest issue of Tarzan, and, on really lucky weekends, find one. It was like winning a gazillion dollars in the lottery. The mere thought of joining the ape-man on his romp through the jungle was more than I could resist. I became a devout Episcopalian. Gradually, Tarzan was replaced by other rewards. Marshall and I were recruited to carry the California and American flags in the procession. They had great yellow tassels that we would wind up tightly and release during over-long sermons, anything beyond five minutes. The challenge was to see whose tassel would twirl the longest. When that became boring, we could always watch our parents frantically mouthing words to make us behave. Then I was given an immense promotion. I was invited to sing in the six-person choir that consisted of five elderly white-haired ladies and me. We all had loud voices; singing on key was secondary. I often pictured Jesus wearing earplugs. Eventually I was allowed to carry the cross and lead the whole parade. I became an acolyte and served the priest, lit candles, rang bells, carried incense and even served as a junior lay leader. I became seriously religious and entertained the thought of becoming a priest. Crosses that glowed in the dark and Brother Jones were in my distant past. There were numerous side benefits as well. The first was having a Godmother who became my second grade teacher. She was willing to overlook my extensive first grade rap sheet. I still have my report cards where every subject was given a C and every behavior trait was checked below the line. Listens in class, no; comes to school on time, no; wears appropriate clothing, no— you get the point. I think the latter came about because I didn’t like to wear underwear. Once I got a rather delicate part of my anatomy caught in the zipper and the teacher had to help get me unstuck. That cured the underwear bit. I quickly learned in the that being a teacher’s pet beat being spanked, which was still an option in those days. Both my grades and behavior improved. Gainful employment was another benefit. At age 11, I obtained my first serious job of working for one of my fellow choir members, Mrs. McKenzie. She lived in a large house overlooking Placerville and had a yard full of weeds that I was paid $.75 an hour to pull. She also had a big German Shepherd named King who topped the scales at 100 pounds and had a serious attitude problem. His idea of fun was to run at me full speed, bark ferociously, and screech to a halt about six inches away, with his jaws snapping. “He just wants to play,” Mrs. McKenzie would assure me. Yeah, right. That dog wanted to eat me. He knew it and I knew it. My third time there he made an attempt. By the time Mrs. McKenzie responded to my yells, King had helped himself to a generous portion of my pants and was about to start on my leg. I went home with a few bruises, an extra five bucks, and the promise that King would henceforth be kept in the house. Of course he wasn’t. A month later King climbed over the fence and took a chunk out of a passerby. Mrs. McKenzie ended up with an $1100 dollar fine and a court order to keep the dog muzzled. After that, King took a liking to me, unfortunately. I would enter the yard and he would come charging at me just like old times. He would slide to his six-inch screeching halt, pound his muzzle on my leg in a symbolic bite, and then roll over so I would rub his belly. It was a very one-sided friendship. Along about 12, I was invited to be the church janitor. Each Saturday I would hitchhike the three miles to Placerville and earn my weekly paycheck of four dollars. While this may seem rather paltry in our present age of instant billionaires, it was a fortune to me in 1955. After cleaning the church, I would beeline it to the Hangtown Bowl, buy cherry cokes and play my favorite pinball machine. I was hot. With one thin dime I could coax enough free games to last all afternoon. My newfound wealth also meant I could peruse the Placerville Newsstand and spend $.50 a week on the latest Max Brand or Luke Short Western. I became hooked on cowboy books. Then I discovered the Gold Chain restaurant and its incredible coconut cream pie. Talk about addiction. One fourth of my weekly salary went to support my pie eating habit. After all of that, I still had a buck to get me through the week and a buck for savings. I joined the church Boy Scout Group and the church Youth Group in addition to my roles as acolyte, choir member, janitor, etc. Had there been any more church groups, I would have joined them as well. The church became a central part of my life and got me through some tough times. I did a lot of growing up there. It even played a role in my ‘discovery’ of girls. Fortunately, confession wasn’t a requirement of the Episcopal Church given what I learned in the basement stairwell. Had I been a good Catholic, I would still be saying Hail Marys. By my senior year in high school, I had given up my youthful thoughts of becoming a minister but still took my religion seriously and attended church regularly. College was coming, however. My faith and many other things I accepted as true were about to become maybes. NEXT FRIDAY’S BLOG: My rock that was Peter relocates itself to an active fault zone.